I made this unit study for Baloo, in 2nd grade, but I’m sure a 1st or 3rd grader could use it just fine. Probably even a kindergartener if you’re willing to help with the reading and writing! All of the information you need is right in this pack. Anything with questions is either answered in a booklet or is an opinion-based question. I want our historical studies to be fun and educational, but mostly I wanted Baloo to be able to comprehend what we’re learning. In my experience, the best way to do that is to make it relatable. I wanted him to picture himself as an Egyptian, or a pharaoh. There is no required reading, although I do have a few suggested books that you should be able to get at a local library. My library is pretty limited in resources, so I’d strongly urge you to look for additional books about Ancient Egypt. Baloo read through many of the books with me or by himself and picked up on a lot. His favorites were the “You Wouldn’t Want To Be…” series, probably because they are eye-catching. We did a lot of extra projects along with this study, which I’ll outline here, along with what pages we did on what days. The download link will be at the bottom of the page! We’re starting off with very little knowledge of Egypt, so I wanted to start with a general geography. The first unit is my Ancient Egypt pack is all about geography. We read through the book together. As we were reading I pulled up Google Maps. First we found where we live and a few other spots I thought Baloo would know in the USA. Then I backed all the way out so he could see where Africa is compared to the US. Then we started to zoom in on Egypt, and then the Nile River. We read through the booklet as we were looking at Google maps, and I think that helped Baloo to understand it a bit better. Then we did the satellite view of the Great Pyramids of Giza and the Great Sphinx. I showed him how close they are to the Nile River. Lastly Baloo filled out the Ancient Geography worksheet. I told him that all the answers were in the book and encouraged him to finish it by himself. The only part he had trouble with was the 3 things the Nile River brought to the Ancient Egyptians. Day 2 was all about the Sahara Desert and the Nile River. Baloo drew this picture based on the only desert he knows – the Sonoran Desert. I’m not so sure than the sahara desert has saguaro cacti though. 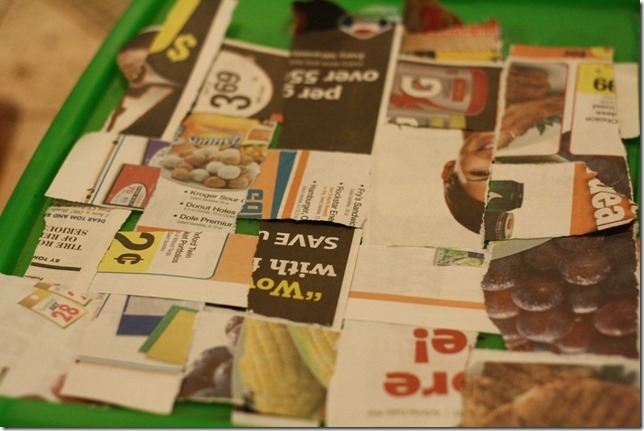 After we talked about the Nile River we decided to make our own “Papyrus” paper. 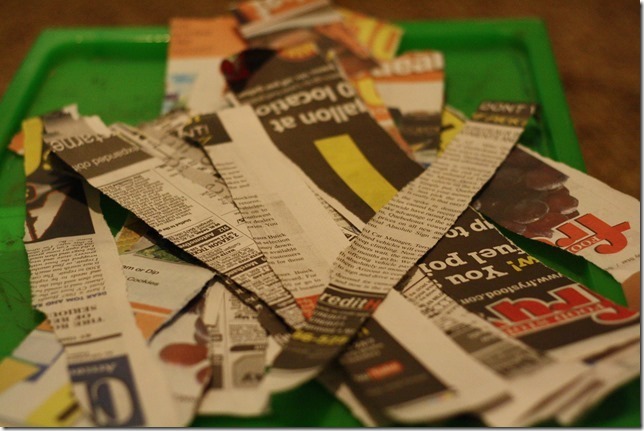 Seeing as we don’t have any papyrus, we substituted newspaper. 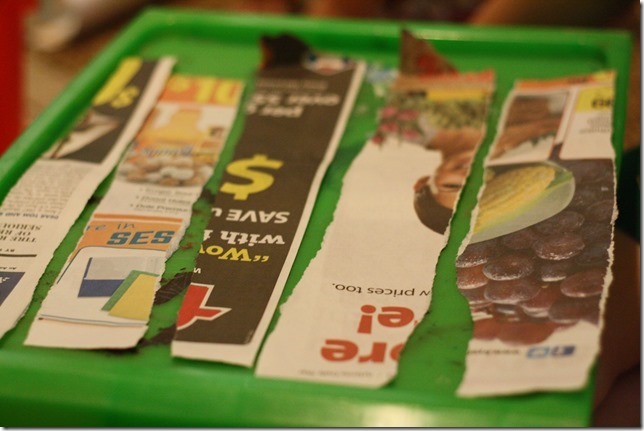 First we ripped the newspaper into strips. To make it stick we used watered-down glue. It was probably 2 parts water to 1 part glue. We painted it on one side,and after that dried we flipped it over and repeated. 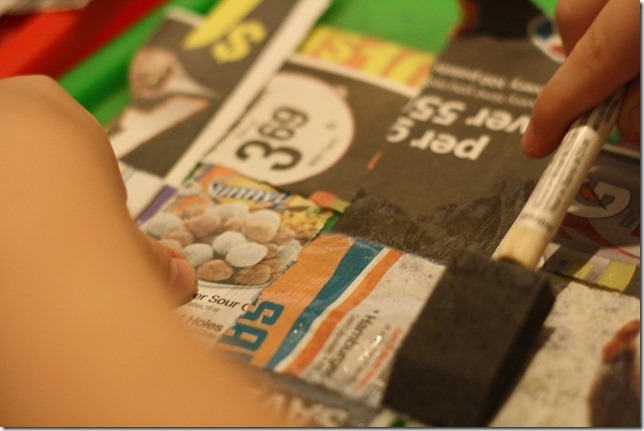 Once the glue was completely dry we took smooth rocks and rubbed them on the paper. I’m pretty sure this didn’t actually accomplish anything, but it is part of the process the Ancient Egyptians used! Today we finished the Pharaoh unit. 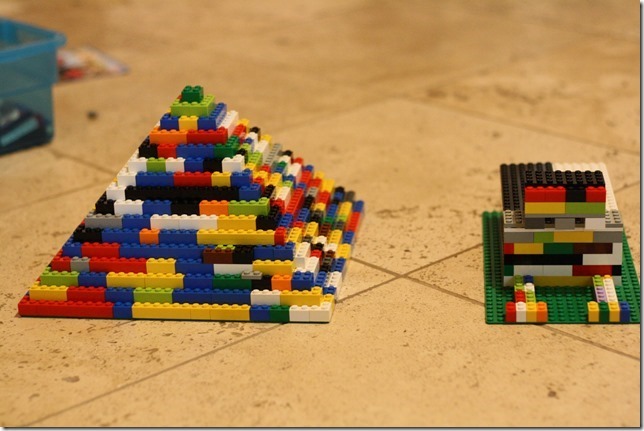 We talked about how Pharaohs were Kings and ruled over the entire civilization. Then Baloo designed his own headdress and made up his own law – No Killing. Today was pyramid day. I find the Great Pyramids to be quite fascinating, but mostly because of their size and their age. They are huge and old! 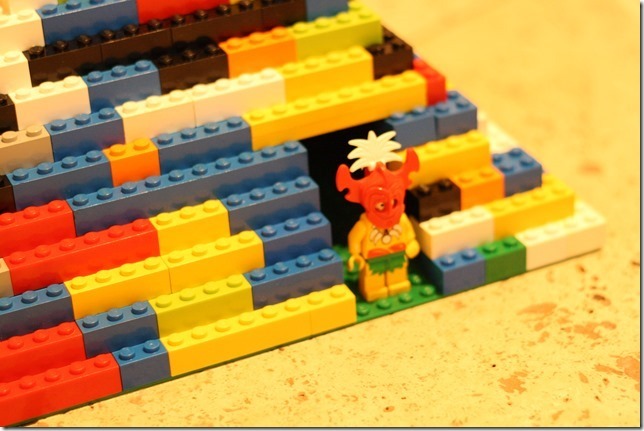 When we were done with the pyramid pages, we built a pyramid with Legos. Even that was hard work! We all worked together (even Logi-Bear!). The boys wanted to fill it up with Lego people. When we had finished, Baloo insisted on making a Sphinx to go with it. So, I said, Why Not! And we built one together. 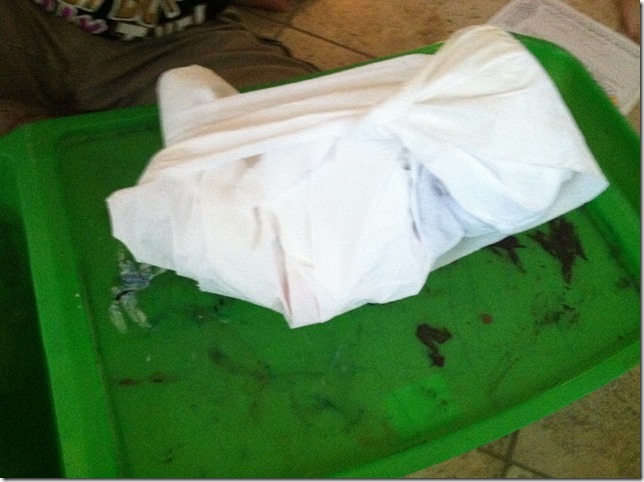 Mummies are probably one of the more interesting parts of Ancient Egypt for little boys. I think they’re kind of gross, but it’s neat how much they were able to preserve and what we can learn from them even now, thousands of years later! We used these juice tops to act as our amulets and wound them up during the mummification process. We don’t have any tombs on hand, so we used a shoebox in a pinch. We also chose not to use resin to keep the toilet paper on…the Egyptians wouldn’t be impressed, but I think the point got through! Gods. We didn’t do much extra on this day but we did discuss how the Ancient Egyptians believe in many gods. I want my kids to know about many types of beliefs. He wasn’t too interested, so we didn’t go into great detail. Hieroglyph Day was easily Baloo’s favorite day of this entire study. He loved the “Crack the Code” and begged me to make him more and more sheets. I did as many as I had patience for! He had so much fun it! I had intended to use our papyrus paper from day 2 to paint hieroglyphics, but he had so much fun with the crack the code that I didn’t bother. We kept it simple and chose to just read the book. Baloo loved hearing about the kids in Egypt and started to identify with them a bit…although, he wasn’t interested in getting sidelocks. Oh well! Anyway! Find a book about a famous Egyptian pharaoh and read it to/with your kid. Then have them write a few sentences about the person. (You can write the sentences for them too, that’s perfectly fine! I’ll be writing Baloo’s ). The idea is to get them engaged, not perfection. Whatever they find interesting about the person is perfect. I aim for 2-3 sentences in a narrative at this age. And that’s the Ancient Egypt Unit Study! I have to add a few things at the end. Please feel free to not follow my schedule at all and do your own thing. I wanted this to be fun and engaging for the kids. Baloo and I went off on many tangents and we didn’t finish it all in 2 weeks…and that’s fine! My goal was to have a 10 day unit study, but I ended up with 9, which I feel is even better. That gives an extra day for another project, a catch-up day, or review day. 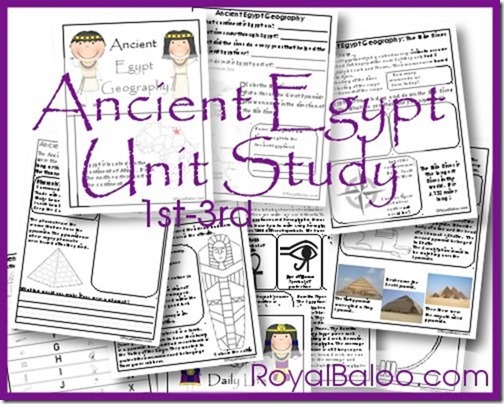 Click Here to Download the Ancient Egypt Unit Study! 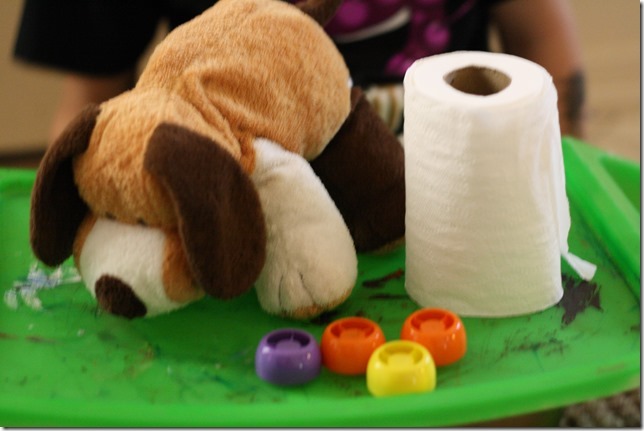 If you have preschoolers, make sure to check out the pack by 3 Dinosaurs! Keep your littler ones entertained while working with the bigger ones! I featured you and 3dinosaurs on blog today highlighting these unit studies! They look great & I can’t wait to use them! 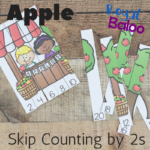 I just love your printables! 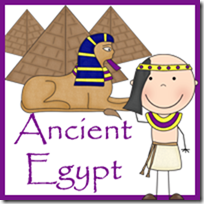 I’m featuring this post with one image in a round up of Ancient Egypt Activities & Printables at Every Star Is Different this week. Thank you for all of your hard work!